Heather's Perfect Posts: Spooky Scene! In class, we were decorating our classroom with Halloween decorations. 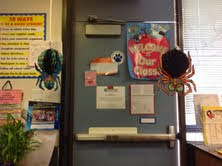 When I first walked into the classroom, I saw two enormous spiders hanging down from the roof! Do you have any decorations for Halloween?